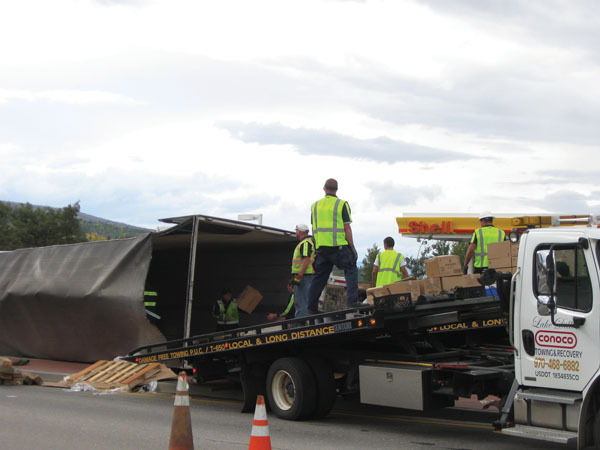 The northbound lanes of Highway 9 in Silverthorne closed for more than five hours Tuesday after a tractor-trailer crashed just before 3 p.m. The semi was attempting to make a right turn off Interstate 70 and spilled goods bound for Walmart across the road. The driver was uninjured and no other vehicles were involved in the wreck, according to a statement from Lake Dillon Fire-Rescue, which sent personnel to the scene. Crews check for any hazardous materials and off-loaded the spilled merchandise so the trailer was able to be cleared off the road. Traffic was rerouted to Stephens Way and around to Wildernest Road while the closure is in place. The semi was reportedly traveling west down I-70 from the Eisenhower Tunnel and took the 205 exit into S’thorne, but failed to complete the right turn onto Hwy. 9 and crashed in front of the Shell station just north of the interstate, according to the statement.